Many thanks to SWLing Post contributors David and Monti who share a link to Radio Garden, a new web-based interface for exploring online radio stations across the globe. […]Radio Garden, which launched today, is a similar concept—a way to know humanity through its sounds, through its music. It’s an interactive map that lets you tune into any one of thousands of radio stations all over the world in real time. Exploring the site is both immersive and a bit disorienting—it offers the sense of lurking near Earth as an outsider. In an instant, you can click to any dot on the map and hear what’s playing on the radio there, from Miami to Lahore to Berlin to Sulaymaniyah and beyond. The project, created for the Netherlands Institute for Sound and Vision by the interactive design firms Studio Puckey and Moniker, was built using an open-source WebGL globe that draws from thousands of radio stations—terrestrial and online-only streams—overlaid with Bing satellite imagery. Read the full article at The Atlantic. Click here to use Radio Garden. This entry was posted in Broadcasters, News, Web Radio and tagged Internet Radio, Radio Garden, WiFi Radio on December 13, 2016 by Thomas. 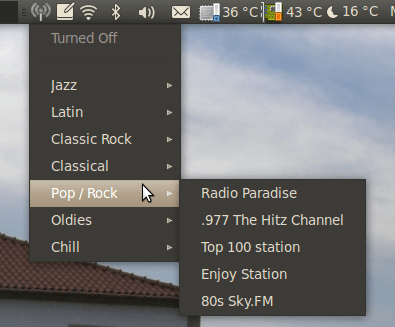 I have been streaming online radio using a PC for a number of years using a really simple programme for the GNU/Linux operating system called “Radio Tray“. Radio Tray is a tiny programme written in Python that uses the Gstreamer “back end”. This programme is so small, that you can turn that old 1990’s vintage Pentium II laptop that’ gathering dust in a broom closet into an internet radio. Just choose a very “lightweight” distribution of GNU/Linux. For instance, on an old “original” Asus EeePC netbook, with a 900 MHz. Celeron processor, 512 MB RAM and a little 4 GB solid state hard drive, I installed the “Debian” distribution but used the lightweight “JWM” window manager for the GUI. JWM isn’t pretty, but it works great! You can get “Radio Tray” using the package management system of just about any GNU/Linux distribution. I know for sure it’s in the “repos” for Ubuntu, Debian, Arch and Fedora along with all of the derivatives. Unfortunately, it’s not available for Windows and MacOS. But, the GNU/Linux OS is “free as in freedom and free as in free beer” as they say! All of your radio station “bookmarks” are stored in a simple “bookmarks.xml” file that makes it a breeze to copy your bookmarks from computer to computer. Over the years I’ve accumulated a thousand or more (I’ve lost count) internetradio stations in Radio Tray. Radio Tray is capable of handling just about any streaming format. My online “dx challenge” is finding the “real” stream URL of the station that’s often buried inside of browser based “Flash” players. But, since these days most radio stations outsource their audio streaming to one of about half a dozen streaming audio providers, once you’ve figured out the provider’s URL pattern for one station, you’ve figured them all out. I’m able to figure out the “real” stream URL about 90% of the time. Some are easy, while some require a bit of detective work. That also means that I don’t depend on streaming aggregators, since stream URL’s are changing all the time and sometimes it takes the aggregator a while to do an update. I can just update a station that I’m interested in myself. I also wrote a blurb about radio tray on my own (very much neglected) website a couple of years ago. Thanks, Bob! I was not familiar with this app–seems like a simple addition to any PC. This entry was posted in News, Web Radio, WiFi Radio and tagged Bob Chandler (VE3SRE), Internet Radio, Radio Tray, WiFi Radio on October 24, 2016 by Thomas. Internet Radio: Mark wants to know about your listening habits! I am a heavy user of internet radios and have a few scatted around the home, the one most frequently used is the Grace in the kitchen. What stations do people listen to? I listen to lots of different things while cooking, what I do is tune to a station local to whatever I am preparing. So that means a lot of Asian stations; Indonesia, Vietnam, India, Japan, China, Laos etc! A few months ago spending time in Southern California put me in the mood for Mexican food, so there has been a lot of Mexican radio playing in the kitchen lately. On the special occasions when cooking Grits for breakfast I usually listen to 103.3 AshevilleFM. The Logitech in the bedroom is usually tuned into European stations late a night as I drift off, and as I wake up and dress I’m usually listening to Japanese community radio stations. In the main living area mostly USA alternative and indi rock, NPR or college radio is on. I am a very serious flight-simmer and love exploring around the world this virtual way. I’m very serious about this so preflight and route planning takes up to an hour, so in the hours before a flight I quite typically listen to a station in the city my Cessna-404 twin turbo happens to be at that particular time. I’m kind of interested – what are you guys listening to on internet radios? PS. Oh and the Como Solo looks great – Im ordering one! Your query is timely, Mark, as someone recently asked me the same question. I primarily use Internet radio to listen to music and local news outlets. In terms of music, I love almost everything, but especially Jazz, Classic Rock, Big Band, Brazilian music, French, Mambo, Zydeco, Electronica, and, frankly, anything a little eclectic and musically interesting. 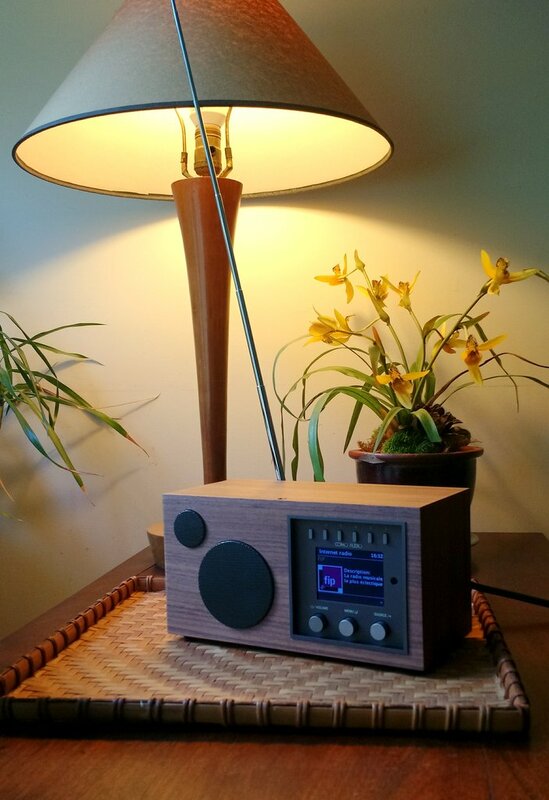 Some of my favorite music stations are: The UK 1940s Radio Station, RFI Musique, FIP, Radio Bossa Nova, KBON, Espace Musique (various outlets), CBC Ambient Lounge, Kanal Jazz, Radio Swiss Jazz, WNMB, RadioNostalgia, Celtic Music Radio 1530, WNCW, Radio 6 and Fréquence 2 to name a few. In terms of news and talk, I listen to: CBC Radio 1 (Toronto, Montreal, St. Johns, Charlottetown), WFAE, WCQS, Alaska Public Media, Vermont Public Radio, France Inter, Radio Canada, ABC Radio Australia, ABC Northern Tasmania, Radio New Zealand National, BBC World Service, 7RPH, Federal News Radio, ABC Radio Perth and many, many more. I especially love finding some random, local radio station and eavesdropping on their community news! I have well over 100 stations/favorites organized in various folders on my WiFi radios. Honestly, this 2016 election season in the States has so heavily dominated domestic news, I’ve focused almost exclusively on stations outside of the US to seek a little refuge. Of course, I’m also a heavy shortwave listener. 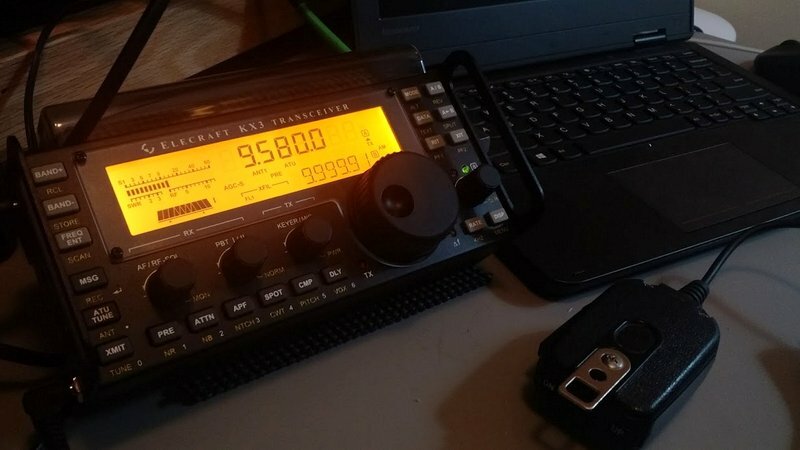 While using a WiFi radio lacks the “fun factor” and skill of SWLing, it certainly serves up a world of diversity and is the perfect compliment to shortwave listening. Radio Australia serving up a blowtorch signal into North America this morning–a steady S9+20db on my Elecraft KX3. As I type this post this morning, for example, I’ve been listening to the CBC and France Inter on my WiFi radio (the audio actually emanates from my vintage Scott Marine SLR-M via an SStran AM transmitter). I’ve been muting the WiFi radio from time to time to listen to the ABC top of the hour news and music programming on Radio Australia with my Elecraft KX3 (above). What do you, dear Post reader, listen to on your WiFi radio, mobile device or computer? Please comment! This entry was posted in News, Shortwave Radio, Web Radio, WiFi Radio and tagged Como Audio Solo, Internet Radio, Mark Fahey, Sangean WFR-28, WiFi Radio on October 22, 2016 by Thomas. 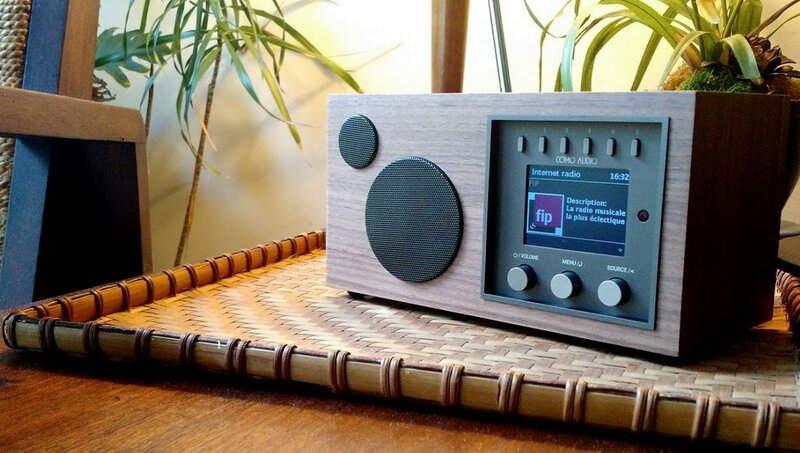 Regular SWLing Post readers might remember that this past summer, I made an impulse purchase–and in doing so, backed a Kickstarter campaign for the new Como Audio Solo. But exactly why did I buy this small, self-contained digital music device–? Having just completed an in-depth review of several WiFi radios, I certainly didn’t need another. But the good-looking Solo, with its clean design and walnut casing really caught my attention…I couldn’t resist checking it out. Plus, in backing the radio via Kickstarter, I was able to purchase it for $100 less than the predicted future retail of $299 US. The Kickstarter campaign funding Como Audio was prompt in communicating updates with backers and providing even more product options during the wait for production and delivery. Although several other snazzy finishes for the Solo were brandished before me, I stuck firmly by the walnut veneer I’d originally chosen. Fast forward to the present. I finally received my Como Audio Solo a few weeks ago, and have had time to play with it. While I haven’t had time to explore every nuance of this radio, of course, I have had an opportunity to form some opinions. 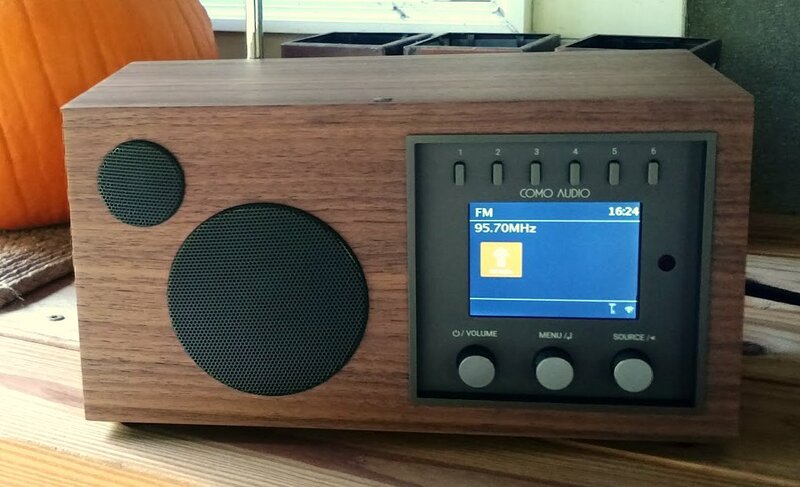 I don’t often comment on the design of radios I review, but in this case it’s worth noting. The only element of the design I’m not typically keen on? I’m not the biggest fan of devices that sport colored backlit displays; to me they appear a bit flash and faddish, undermining a radio’s overall aesthetic. But I must say, the Solo pulls it off. The color display in this case is somehow not too distracting–it’s soft yet crisp, and easy to read even at a distance. In short, the Solo is a stunning piece of kit, especially with that warm walnut casing, and looks right at home in any setting–office, living area, kitchen, or at the bedside. I’ve only one gripe with the Solo’s ergonomics: the front control knobs are a little too close to the bottom of the recessed controls area. When I try to turn a knob–for example, attempt to tune the FM band–I find my fingertips won’t fit between the knob and lower edge of the recessed panel, making the knobs a little hard to turn in one fluid motion. (Of course,this is also due to the fact that I have big fingers; my wife doesn’t seem to have this problem). But this isn’t a dealbreaker as I’m finding I don’t often need to reach for the front controls, anyway. Why? Because the rig’s IR remote–or better yet, its smartphone app–control the radio effectively at any convenient distance from the radio. Sweet. I’m a sucker for quality audio fidelity, and I must admit that this was one of the biggest deciding factors in purchasing the Solo: it touted extraordinary audio in a modest package, being designed around an acoustic chamber/chassis containing a 3″ woofer and 3/4″ dome tweeter fueled by a 2 X 30 watt RMS amplifier. I was very curious whether it could live up to its initial claim. After turning on the Solo for the first time, I immediately wanted to hear audio, so I put it in Bluetooth mode and played a few songs, ranging from Jazz to Electronica. 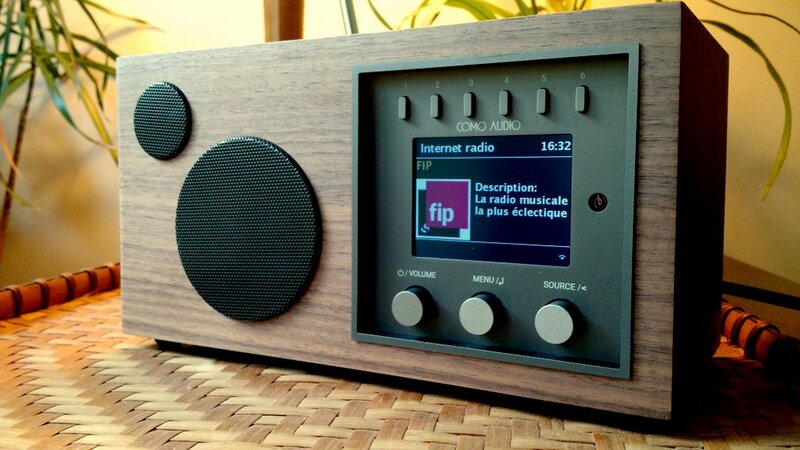 The audio is strikingly reminiscent of my Tivoli Audio Model One…which is to say, it’s excellent. It packs more audio punch than any of the radios I reviewed in my WiFi radio comparison. Out of the box, the audio is fairly well-balanced, too. But you can tweak the equalizer, and I did, drawing in a little more bass and treble. My wife (also a bit of an audiophile) was impressed. And yes, the sound is all the more remarkable considering the radio’s relatively small form-factor: little box, big voice. 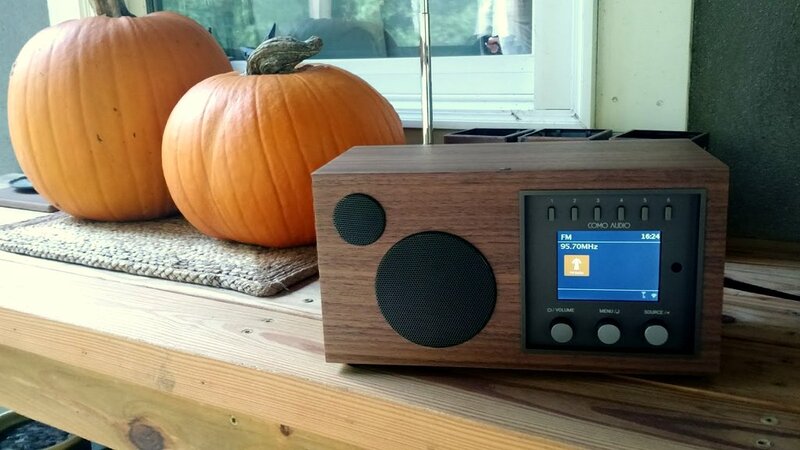 The Como Audio Solo is one of the few Wifi radios on the market that has a built-in analog FM and DAB receiver (save the $120 Sangean WFR-28, which has analog FM reviewed here). Since I live in the US, I can’t comment on DAB reception. I have, however, had an opportunity to test the FM analog reception. Keep in mind, I live in a rural area and require a decent FM receiver with telescopic antenna fully extended just to listen to my favorite regional programming. When I tune the Solo to my benchmark FM stations, it can receive them–but not as effectively as many of my other radios, including the WFR-28. Even when forced to use the Mono setting only, the stations it receives carry too much static for good listening. So obviously the Solo isn’t as sensitive as some of my other radios, at least in this setting. Indeed, few stations it receives in this area are able to lock in to the point that there’s no static in the received audio. For out-of-towners, this is a bit of a disappointment. With this said, I imagine if you live in an urban area, the FM receiver should more than please you. I’ve no doubt it can faithfully reproduce beautiful audio from local FM outlets. I should add that, while FM reception isn’t stellar for distant stations, the RDS information does convey even when the audio isn’t full fidelity. 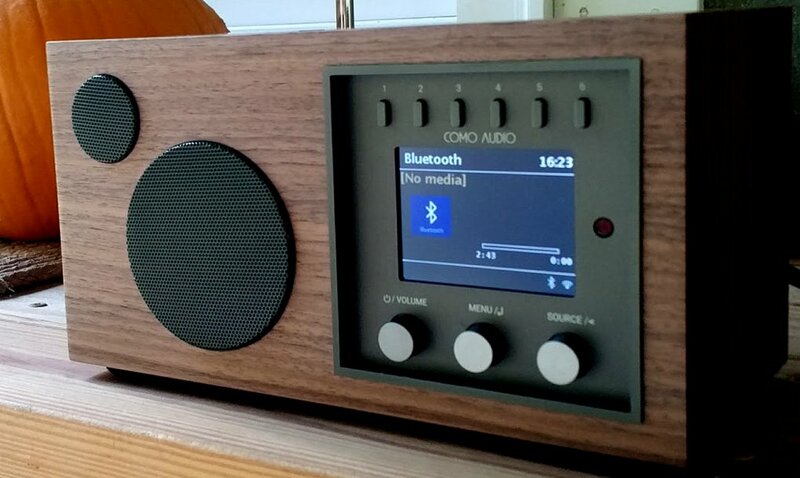 Of course, the main reason I purchased the Como Audio Solo was to use and review it as a WiFi radio…nothing at all to do with that sharp walnut chassis, or audio power. As I outlined in my WiFi Radio primer, WiFi radios rely on station aggregators–extensive curated databases of radio stations–to surf and serve up the tens of thousands of streaming stations around the globe. 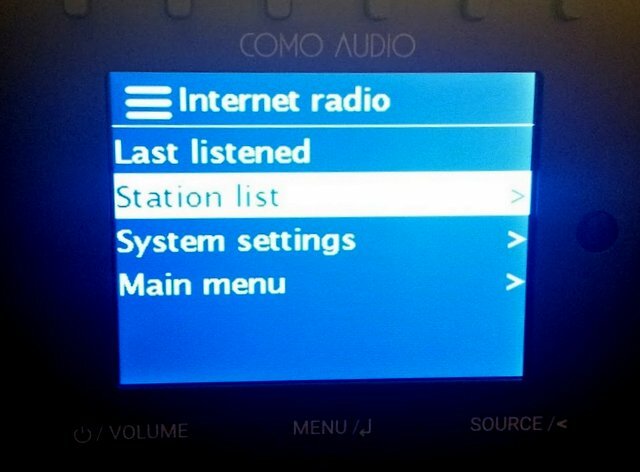 Based on feedback from Como Audio shortly after the Kickstarter launch, I was under the impression that the station aggregator of choice was vTuner. This concerned me, as vTuner’s reputation as an aggregator is somewhat maligned due to a series of documented faults and weaknesses. Fortunately, this turned out not to be the case: after the initial confusion, I soon discovered Como had adopted the more robust Frontier Silicon aggregator, instead–a better choice. 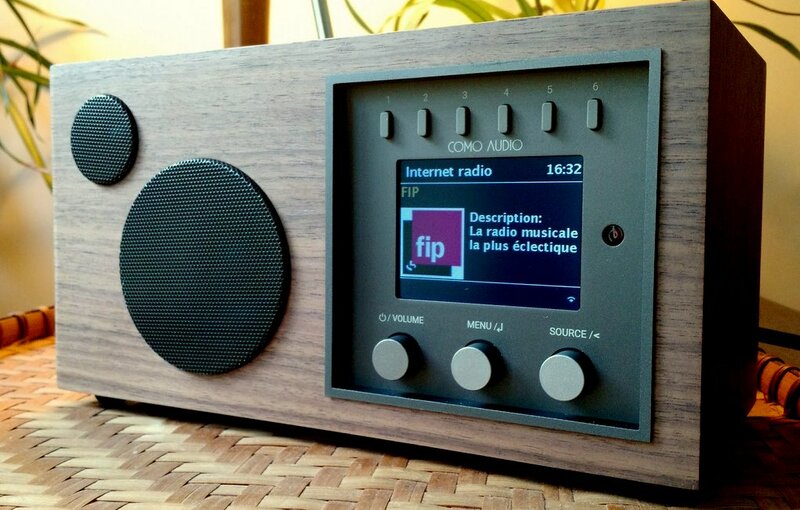 Click here to read our primer on setting up your Como Audio product on the Frontier Silicon radio portal. 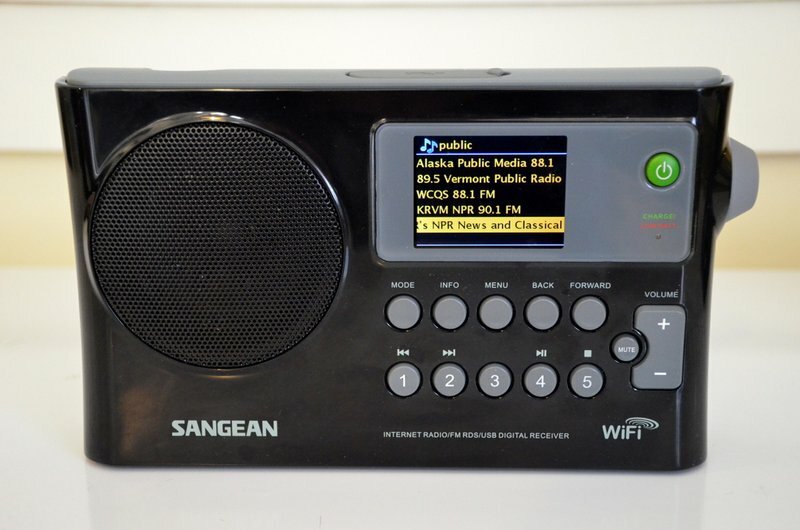 Since I’m a pretty big fan of Frontier Silicon and since I’ve already been using their service with my Sangean WFR-28, once I connected my radio to my user account, the WiFi portion of the radio felt identical to that of my WFR-28. Simply brilliant, as the Frontier Silicon radio portal gives the user flexibility to create station lists and folders with ease–all of which readily convey to the radio itself. The Solo also features six dedicated memory buttons on the front panel for quick access to favorites. Turns out, there’s also a comprehensive manual available online for download (click here). And am I please with the Solo so far? I love the Solo’s design–this certainly is a handsome product. Moreover, I love the audio, and am pleased that it delivers the fidelity promised by its Kickstarter campaign. The Solo and Duet are loaded with features, connections, Aux In and Aux Out audio and digital ports–more, in fact, than any similar device with which I’m familiar. I regret that the rig’s FM isn’t suited for country life, but the audio coupled with its stylish exterior do make up for this somewhat. I do wish the Solo had an internal rechargeable battery option. Being able to move the receiver to different locations within a home or building could be a major plus for rural FM reception. As my friend John pointed out, however, the audio amplifier is robust enough, it might have been a challenge to implement an affordable-but-effective internal battery without compromising the audio amplifier’s needs. 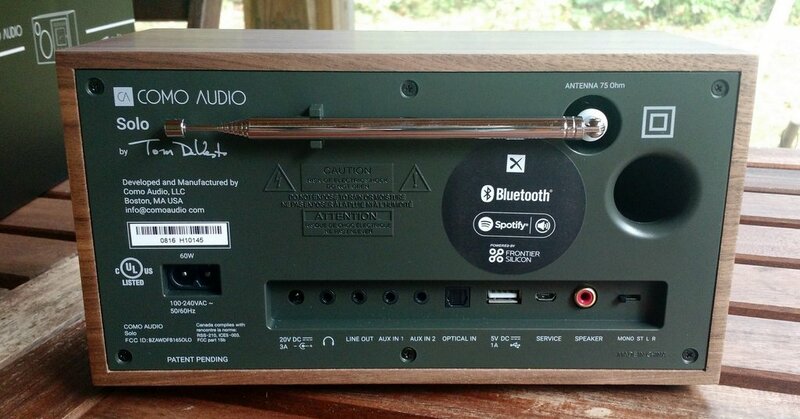 In truth, I favor audio fidelity over portability for a tabletop radio. In conclusion…do I have any backer’s remorse? Absolutely not–! In short, the Como Audio Solo is a keeper. I’m still marvelling at this classy and dynamic radio that fills our home with rich beautiful audio. A few weeks in, the Solo has already become a permanent feature in our abode. It’s one of the few radios I have that meets my artist wife’s approval in terms of both design and audio. Great job, Como Audio! If the Solo is any indication of radios to come, I’ll certainly be looking for your future innovations. 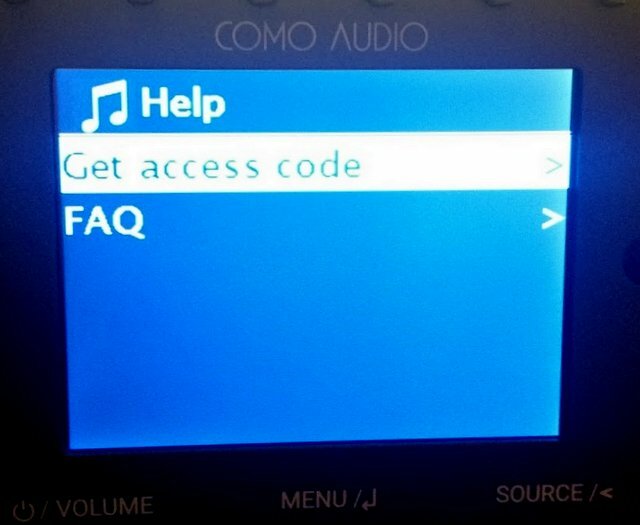 Click here to order the Como Audio Solo and Como Audio Duetto. This entry was posted in Digital Audio Broadcasting, FM, New Products, News, Radios, Reviews, Web Radio, WiFi Radio and tagged Como Audio, Como Audio Duo, Como Audio Internet Radio, Como Audio Solo, Como Audio Solo Review, Como Audio Wifi Radio, Sangean WFR-28, WiFi Radio, WiFi Radio Review on October 20, 2016 by Thomas. 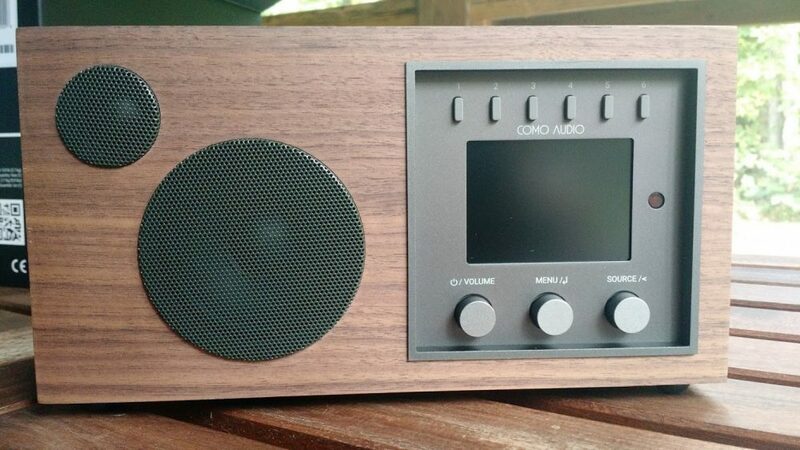 This weekend, I received the Como Audio Solo that I backed in a summer Kickstarter campaign. I’m pleased the Solo not only met delivery expectations, but I’m happy with the overall quality of this radio. I will post a preliminary review soon. Very sorry for the delayed reply. […]Our products use Vtuner for the Internet radio stations and Podcasts. I was a little bummed to have received this information because I’ve heard very little praise for vTuner among WiFi radio enthusiasts. To make a long story short, I spent a lot of time trying to figure out a way to pair my Solo with the vTuner aggregator. The owner’s manual has no information about using the aggregator nor how to manage and organize stored stations. 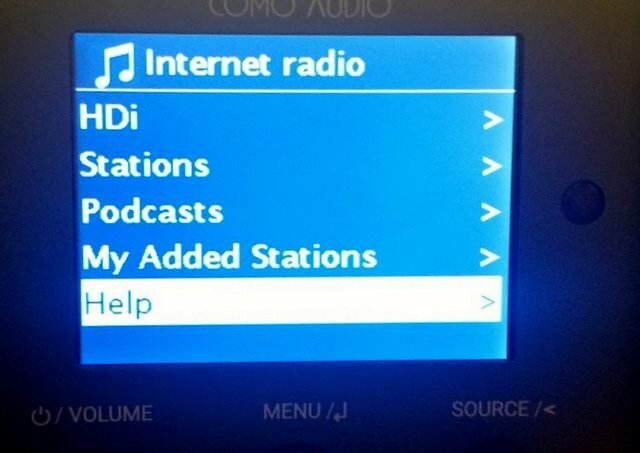 The only help Como has published thus far is a short video which shows how to add favorites via the radio itself–not via a web portal. When taking a closer look at the back panel of the Solo, though, I noticed a Frontier Silicon logo. My Sangean WFR-28 uses the Frontier Silicon aggregator! This explains why the Solo’s WiFI radio interface looks exactly like that of my WFR-28! Obviously, somewhere along the way, Como Audio changed aggregators. I’m not at all disappointed as I give Frontier Silicon positive marks in the WFR-28 review. First, if you don’t already have an account with Frontier Silicon, you’ll need to create one by clicking here. The access code is 7 digits long–simply enter it in the dialog box on the Frontier Silicon web page and proceed with creating your account. Login to My Account > My Preferences page, then click Add another Wi-Fi radio to the account. The access code is 7 digits long, simply add it in the Access Code field on the Frontier Silicon web page. Once your radio is paired, managing station memories is very easy via the Frontier Silicon Radio Portal. I’ve been testing the Como Solo and plan to post a preliminary review soon. Follow the Como Audio tag for updates! This entry was posted in How To, New Products, News, Radios, Web Radio, WiFi Radio and tagged Como Audio, Como Audio Duo, Como Audio Internet Radio, Como Audio Solo, Como Audio Wifi Radio on October 4, 2016 by Thomas.